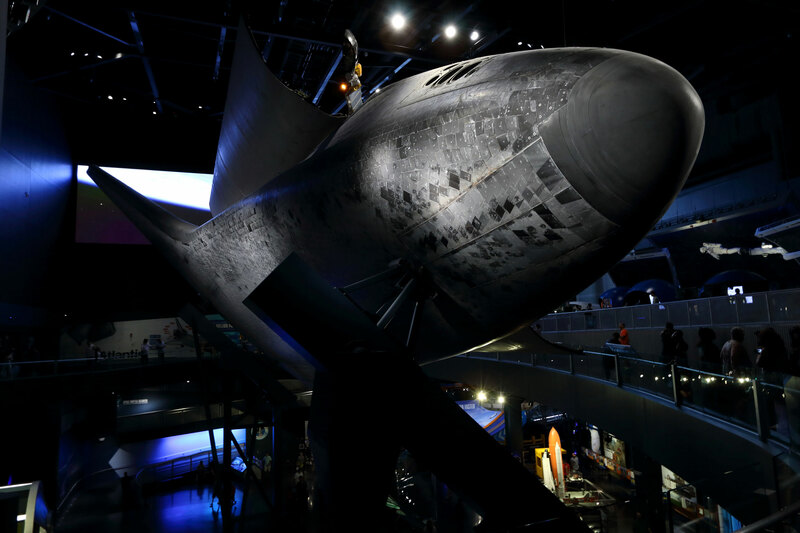 If you’ve never been to the Kennedy Space Center Visitor Complex and you are reading this article, well you owe it to yourself to make that trip at some point. If you have been there before, but not in a few years, I’d suggest that it’s time for a return trip. 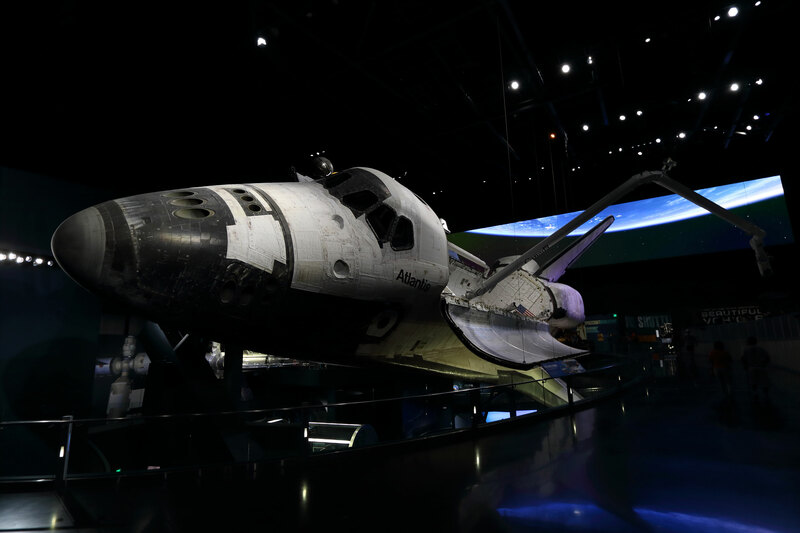 The complex has undergone numerous changes and updates, not to mention the addition of the Space Shuttle Atlantis exhibit. 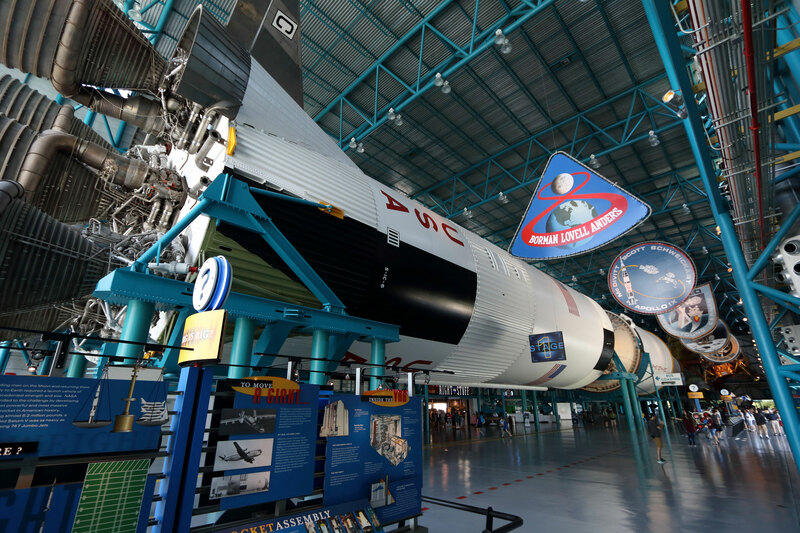 The entire facility is top notch and offers you the opportunity to see and learn about actual spacecraft, rockets, spacesuits, and many more interesting artifacts. In the Rocket Garden you will find many of the early launch vehicles used by NASA for both unmanned and manned spaceflight. From the 77-foot tall Juno rocket used to launch some of the earliest satellites, a Redstone and an Atlas that were used for the Mercury launches, a Titan used in the Gemini Missions, right up through the 223-foot Saturn 1B used to test fly Apollo spacecraft into Earth orbit, and many in between rockets abound in the garden. Each rocket has information near it explaining what it is and what it was used for. You’ll also find simulated Mercury, Gemini, and Apollo Capsules that you can climb in to see just how cramped those vehicles were. There is also an actual Crew Access Arm from the Apollo program that you can walk down just as the Apollo 11 astronauts did on their way to the Moon. 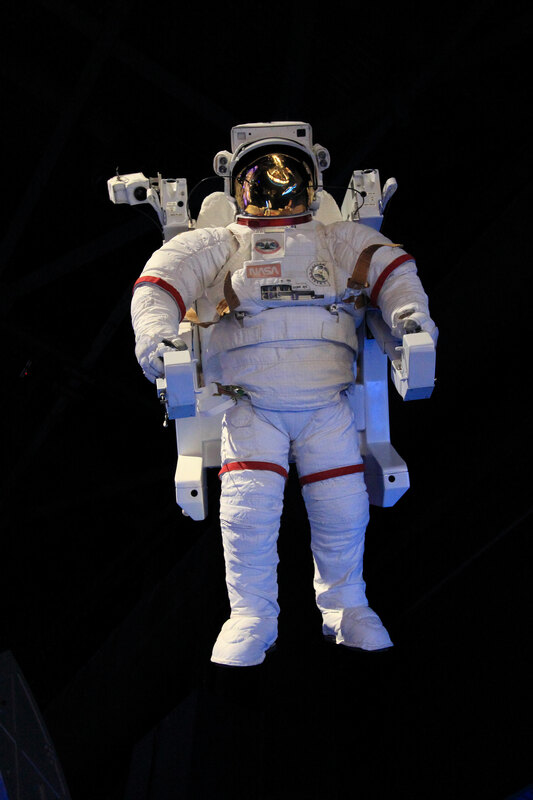 You can meet a real-life astronaut at the Astronaut Encounter where an actual astronaut speaks a couple of times a day. After the presentation, the astronaut normally has time to take your picture with him or her, along with a handshake and greeting! Also available in the Astronaut Encounter theater is a new presentation, “Eyes on the Universe: NASA’S Space Telescopes,” a 3D 4K video presentation which takes you back 13 billion years using images from the Hubble Space Telescope. Also in the main visitors compex there is an IMAX theater showing two different large-format films throughout the day, as well as the Astronaut Memorial where fallen heroes of the space program are memorialized, and a children’s playdome where kids can play in a space themed playground. In the future, the revamped Astronaut Hall of Fame will be opening just outside of the Rocket Garden. While there, be sure to take the free bus tour. It will take you onto the actual Kennedy Space Center property where you get to see the massive Vehicle Assembly Building, the Launch Control Center, and other buildings in the main KSC area, Then you’ll head out along the massive crawlerway and pass by the launch pads used to launch 135 Space Shuttle missions and every manned mission, to date, that has gone to the Moon. If you’re lucky there might be a NASA crawler transporter outside for you to see. At the end of the bus tour you’ll stop at the Saturn V center. You’ll see two presentations, the first in a three-screen theater that covers the early space race with Russia, starting with Sputnik, up through the early Apollo flights up until Apollo 8. Next you’ll move into a second theater, which contains the actual launch control center that was used to launch Apollo 8, the first manned mission to orbit the Moon. The presentation takes you through the countdown to launch of the mighty Saturn V that propelled Frank Borman, Jim Lovell, and William Anders to their historic spaceflight. Following that presentation you’ll enter the main area of the Saturn V building where you’ll see a fully restored Saturn V rocket laid down end to end. Taking up more than the length of a football field, the mighty rocket alone is a lot to take in. Along the way through the building while looking at the Saturn V you’ll find information on the power that the vehicle made, what it took to move the huge vehicle, a brief synopsis of each Apollo mission, a scale model explaining the different stages of the Saturn V, and much more. 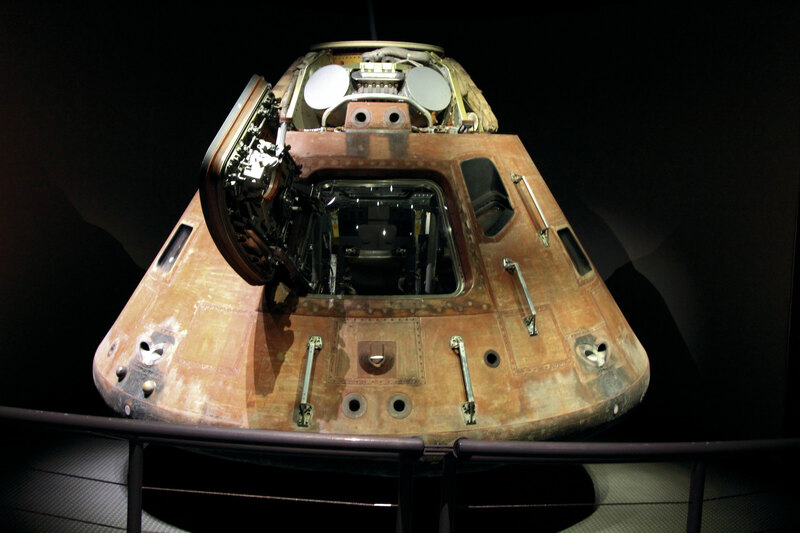 This facility also has the original Apollo 14 Capsule that took Command Module Pilot Stuart Roosa, Lunar Module Pilot and moonwalker Edgar Mitchel, and Commander and moonwalker Alan Shepard to the Moon and back. There is an original Lunar Module that would have been used to land on the surface, a Lunar Rover simulator, actual Moon rocks, spacesuits, and other great artifacts. You can even touch a small piece of a real Moon rock. 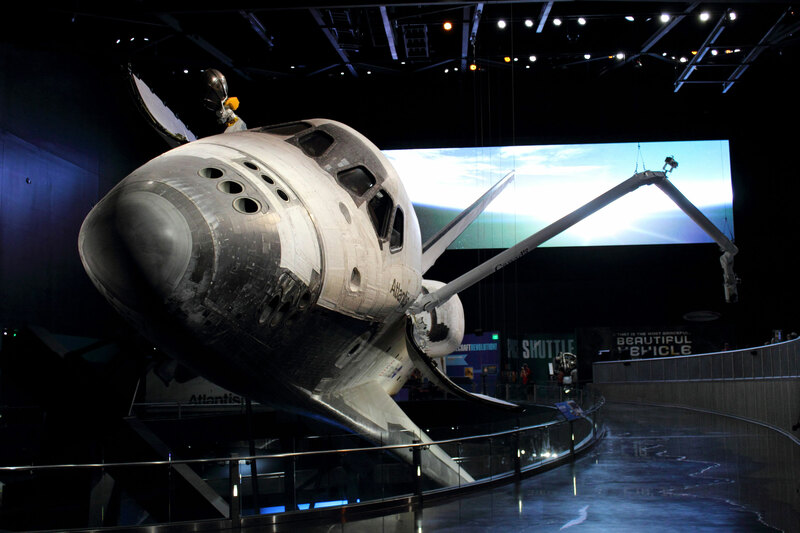 While all of the visitors complex has amazing displays and great artifacts, the latest and perhaps the most spectacular of all the exhibits is the Space Shuttle Atlantis exhibit which opened in 2013. The 90,000 square foot facility is reported to have cost $100 million to build and it showcases the Space Shuttle program like no other facility has done to date. The exhibit is in the main visitors center area. You can’t miss it. Out in front is a massive, 184 foot tall full size replica of the Solid Rockets Boosters and Fuel tank used to launch the orbiter into space. You’ll be able to see the stack in the distance as you drive out to the visitors’ center and it can be spotted fairly easily all the way back in Titusville over 10 miles away. While you are looking up at the massive stack, take a moment and look down, the entranceway is lined with actual rocks from the NASA crawlerway which the mighty Saturn V rockets that took astronauts to the moon rolled out to the launch pads on, and every Space Shuttle flight rolled over those rocks as well. Once inside the building, you’ll walk along a slight ascent with images of the shuttle, astronauts, and more to look at on your way. If it’s not busy you can take some interesting photographs of you and/or your family members with many of these images. When you near the top there are a massive set of windows that overlook the tank and boosters outside and you can see almost the entire main visitor’s center. The view gives you something extra to look at until you head into the theater. Once inside the theater you will be treated with the story of how the shuttle was conceived, built and ultimately flown and maintained. The presentations culminate with the unveiling of the orbiter Atlantis. Atlantis is displayed at an angle of 43.21 degrees (think about that number for a minute) mounted to support pillars using the attachment points for the external tank. The payload bay doors are open and the CanadaArm is deployed, simulating what the vehicle would have looked like on orbit. The orbiter still shows the effects of reentry with plasma scars still on the thermal protection blankets and tiles. If you brought a camera with a decent zoom, look through the crew compartment windows and you can see some of the many switches inside the compartment. On the wall at the engine end of the orbiter is a massive 20 ft. by 100 ft. LED backdrop that displays the Earth, an orbital sunrise, and many other unique visual cues that add to the experience. Look up, there’s an Astronaut with a Manned Maneuvering Unit on. Also on the upper level are simulators that let you try your skills at spacewalking, cockpit mockups of the orbiter, and other interactive and static displays to entertain and educate visitors about the orbiter and the work it performed. There is also an actual Space Shuttle Main Engine on display in the far right corner near the back of the orbiter. As you continue down a sloping ramp you get an up close view of the propulsion end of the orbiter and ultimately the belly of the orbiter and its sophisticated Thermal Protection Tile system. Take your time and marvel over the fact that this vehicle actually launched into space and returned 33 times over its lifetime. The 33 missions included deploying Satellites, performing Hubble Space Telescope servicing, and of course building of the International Space Station. Speaking of the Hubble Space Telescope, inside the Atlantis facility there is a high fidelity replica of the telescope that is 43 feet long and 14 feet in diameter, that can be viewed from the main floor just to the right of the door you exited the theater from, and again from the lower level. On the lower level you’ll find another theater showing highlights of Hubble from its launch in 1990, through its repair missions, and of course showcasing some of the incredible images the telescope has provided to us all. Also on the lower level you’ll find high fidelity replicas of an International Space Station module, a space toilet, tires from Atlantis that actually were used in the final landing of STS-135, and much more. There’s also the actual Beanie Cap from launch pad 39-B. The Beanie Cap, also known as the External Tank (ET) Gaseous Oxygen Vent Arm was used to keep oxygen venting from the External tank from condensing water vapor surrounding that area into water and possibly forming ice which could damage the orbiter. The center has actually made an interactive game below the beanie cap, check it out. Don’t forget to check out the Shuttle Launch Experience where you can find out what it feels, looks, and sounds like to launch aboard a space shuttle! Also near the entrance to the gift shop you’ll find more simulators where you can manipulate the robotic CanadaArm to perform specified tasks, or land the orbiter on the Shuttle Landing Facility. 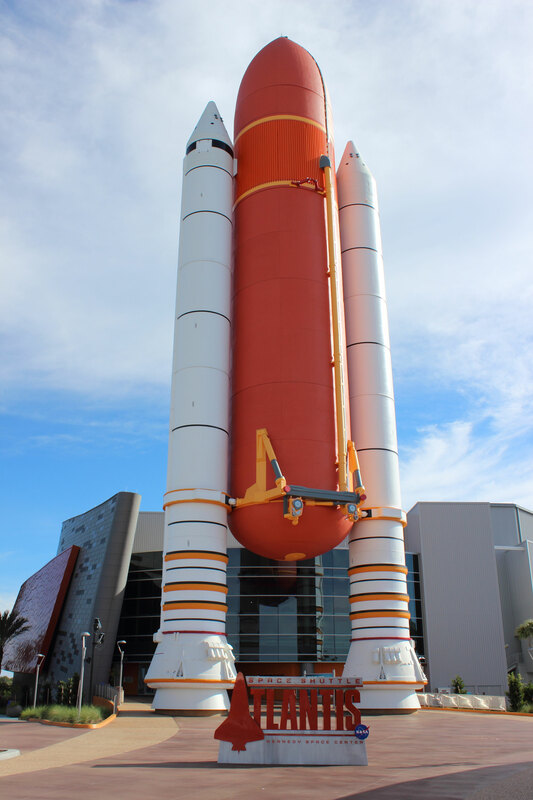 In all the facility contains over 60 interactive experiences, numerous static displays, and of course Atlantis which you can see from almost any angle you can think of. From casual tourists right up to true space geeks, everyone can find plenty to do and see at the Atlantis exhibit. There are many more things to see and experience at the Kennedy Space Center, I only touched on some of the more prominent displays and experiences from my visits, be sure to allow yourself plenty of time to take in all the center has to offer and to see just a bit of what NASA has accomplished so far, and a peek at what is yet to come.